The Persian and Byzantine empires fought for control over Georgia until the 7th century, when the region was conquered by the Arabs. In the 11th century King Bagrat III united the Georgian principalities into one kingdom, with the exception of Tbilisi, which was an emirate under the control of Seljuk Turks. In 1122 King David II, one of Bagrat’s descendants, expelled the Turks and recovered Tbilisi. Under Queen Tamar, whose rule straddled the 12th and 13th centuries, the Georgian kingdom reached its zenith and grew to include most of Caucasia. Georgian culture also experienced a golden age during this period. Then in the 13th century, Mongol armies invaded the Georgian lands. By the end of the 15th century the Georgian kingdom had disintegrated entirely as a result of the Mongol invasions. In the early 1500s the Iranian and Ottoman empires invaded Georgia. In 1553 the two Muslim powers partitioned Georgia’s territory, with Iran taking the east and the Ottomans taking the west. The Iranians and the Ottomans fought against one another for complete control of Georgia until the late 1500s, when the Ottomans were driven out. In the 1720s the Ottomans attempted another conquest, but the Iranians expelled them again. Iran then placed the Georgian kingdom of Kartli under the rule of local Bagratid royals. The Bagratids had originated in the borderlands between Georgia and Armenia. Originally an Armenian dynasty, one branch of the Bagratids eventually became Georgianized. In 1762 Erekle II of the Bagratids reunited the eastern Georgian regions of Kartli and Kakheti, forming a new Georgian kingdom that covered much of present-day Georgia. In the late 1700s King Erekle turned to Russia for protection against foreign conquest, primarily by Iran, and in 1783 he accepted Russian suzerainty in return for Russia’s guarantee to maintain his kingdom’s borders. Nevertheless, Iranian forces sacked Tbilisi in 1795. In 1801 Russia deposed the Bagratid king and annexed the eastern Georgian kingdom to the Russian Empire. Russia annexed the western Georgian region of Imereti in 1810 and the remainder of western Georgia between 1829 and 1878. 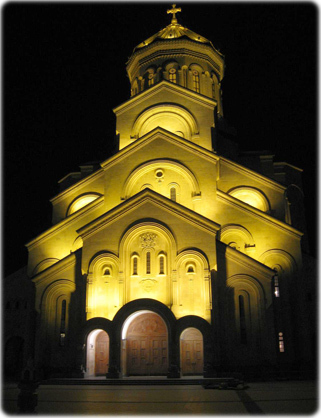 A nighttime view of the Sameba (Holy Trinity) Cathedral in Tbilisi, capital of Georgia. The Russian Empire collapsed in the Russian Revolution of 1917, and an independent Georgian state was established in May 1918. The Mensheviks, or moderate socialists, initially controlled the Georgian government. However, in 1921 during the Russian Civil War, Red Army troops invaded the country under the orders of Bolshevik officials Joseph Stalin and Grigory Ordzhonikidze, both native Georgians. In ordering the invasion, Stalin and Ordzhonikidze were acting against the wishes of Bolshevik leader Vladimir Lenin. Georgia was now under the control of the Bolsheviks. Stalin was, at the time, directing nationality affairs from the central government in Moscow. From this position, he hatched a scheme to join Georgia with Armenia and Azerbaijan. This union was to form a new political entity, the Transcaucasian Soviet Federated Socialist Republic (SFSR). In December 1922, when the Union of Soviet Socialist Republics (USSR) was founded with four constituent republics, one of them was the Transcaucasian SFSR. However, in 1936 the Transcaucasian republic was dissolved, and Georgia became its own constituent Soviet republic, as did Armenia and Azerbaijan. The Georgian republic was called the Georgian Soviet Socialist Republic (SSR). In the late 1980s Communist regimes collapsed in many nations of Eastern Europe, strengthening the independence movements already stirring in the Soviet republics. For the first time during the Soviet period, political parties other than the Communist Party were allowed to participate in elections to the Georgian Supreme Soviet, held in November 1990. The Communist Party of Georgia lost its monopoly on power, with the majority of votes going to the Round Table-Free Georgia coalition of pro-independence parties. Zviad Gamsakhurdia, the leader of the coalition and a longtime nationalist dissident, became chairperson of the new legislature and Georgia’s de facto head of state. In April 1991 the Georgian Supreme Soviet declared the republic’s independence from the USSR. In August the Communist Party of the Soviet Union collapsed after conservative Communists botched a coup attempt against Gorbachev, and in December the USSR officially collapsed. In May 1991 Gamsakhurdia was elected as Georgia’s first president. 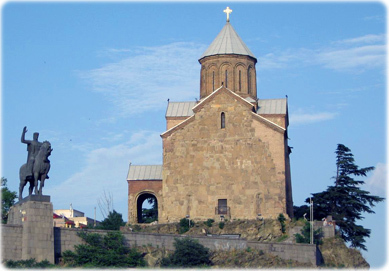 The Metekhi Church of the Assumption in Tbilisi dates to the 13th century. Its location is on a cliff overlooking the Mtkvari River. The equestrian statue of King Vakhtang I Gorgaslan was erected in front of the church in 1961. Copyright © Geographic Guide - Countries.